I MUST ADMIT to not having been terribly familiar with the Myryad brand until now, but most hi-fi enthusiasts – me included – ought to at least know the names behind the company. Myryad was founded in Hampshire, England in 1995 by brothers Chris and David Evans (Product Engineer and Production Engineer, respectively) and Chris Short joined the company soon after as Managing Director. For those who don’t know, Chris Evans co-founded A & R Cambridge (now ARCAM) in 1977 and designed the A60 amplifier, which is something of a legend in hi-fi circles and still goes for reasonable money on internet auction sites. He went on to join NAD and developed all that company’s CD players as well as many of their amplifiers. Chris’ brother David was Engineering Director for NAD and was the first person outside the Far East to gain the privilege to manufacture NAD products. He specialises in Production Engineering and Quality Control. Chris Short took over Mordaunt-Short Loudspeakers in the 1970s and later became the Chairman of Tannoy and then Director of TGI Group (which owned Mordaunt-Short and Tannoy in the 1990’s) before joining Myryad. Phew, I’m glad we got that out of the way. The company’s philosophy is “To create a complementary range of high quality audio separates which offer outstanding performance, graceful aesthetics, first-class reliability and exceptional value for money,” and they are proud of their “Intelligent Engineering” practice where they say: “Audio design requires careful attention to many individual details – grounding technique, wiring layout, structural integrity, critical selection of parts, type and tolerance, and finally the circuit design itself – but to sound great the product must always be designed as a whole, rather than as its parts.” Under this “Intelligent Engineering” they have developed the Myryad DC?input stage for their amplifiers which is “Two sets of Double Complementary transistors linked in cross-coupled configuration, followed by twin cascode transistors.” Okay, that doesn’t mean a whole lot to me, either, but these boys clearly know what they’re on about and this DC?input stage is said to give Myryad amplifiers very low noise and distortion, high input impedance and high speed and stability, resulting in “quieter operation, accurate sound staging and more sense of space between instruments”. Now that does mean a lot to me. They also use multiple regulated power supplies, preventing noise and signal interference between each stage, giving signals speed and power with very low noise. Myryad also proudly use high quality noise- reducing Vishay Bulk Metal Foil Resistors and Polypropylene Film Capacitors – even in their entry-level components – which are said to improve tonal balance, sound staging and musicality and “contribute to the open and full musical sound all Myryad products exhibit”. Currently in the Myryad range is the entry-level Z Series, for the “audiophile on a budget” and the MX Series for the better-heeled audiophile. There is also the new MI Series which is an all-in-one design, set to rival the likes of the ARCAM Solo, et al, and then there are the A Series speakers. It’s three products from the MX range we’re looking at here – CD player, pre and power amps – and it’s safe to say that they have been designed with purist audiophiles in mind. The MXC7000 CD player, MXP2000 pre amplifier and MXA2150 power amplifier are all nicely built into all-metal chassis (albeit the type that ring slightly when you tap them) and the front panels are made from matching 9mm anodised bead-blasted aluminium, available in black or silver. The top and bottom of the fascia curves elegantly; a nice touch, and I really like the way each unit is brought out of standby (power switches are located on the rear) by touching the curved metal appendage (called the “Standby ellipse”) that sits above the LED display. At first I thought they were for aesthetic purposes (they do look lovely) but they are in fact touch switches which require the user to simply touch his or her finger on them very gently. The MXC7000 CD player (weighing a decent 8.3kg and measuring 436W x 95H x 343Dmm) features a 24 bit/192KHz Delta-Sigma DAC with dual differential outputs for lower noise and distortion feeding two low pass filters using high-speed, low noise “Difet” type audio filter op-amps (one per channel). All outputs are DC coupled and individually trimmed during production to provide the best possible signal path and improved bass response. It uses fourteen separately regulated power supplies each purposely designed for its individual application, and if you have a look inside you’ll also find two toroidal transformers, one being exclusively for the audio circuitry in order to keep the audio signal free from digital noise. The distortion output is a low 0.0018% at 1 KHz. In the centre of the front panel is a decent sized and easy to read blue LED display which features CD text, when available, and is dimmable via the supplied remote control. The fairly sturdy CD tray is on the left hand side with the five operating buttons to the right of the display. So it’s a fairly basic-looking CD player, yet elegant none-the-less and certainly gives the impression of being well built with great attention to detail. Around the back, along with the power on/off switch, you’ll find an IEC socket for the supplied power cable, a pair of RCA type inputs, an in/output for the “Smart My-Link” feature (more on that later) and a coaxial SPDIF type output if you wish to use the MXC7000 as a transport with a separate DAC. In this day and age of DACs and digital downloading, I would question – at least at this price point – the exclusion of access, via USB, to the on-board DAC so users can, for example, connect their PC directly to the CD player’s Delta-Sigma DAC, effectively turning the CD player into an outboard digital-to-analogue converter (see AudioLab’s 8200CD player). It seems a little self-detrimental so Myryad must have a lot of confidence, not only in the CD-buying public, but also in the sound of their CD player. We shall see. The MXP2000 preamplifier weighs 7kg and measures 436W x 95H x 343Dmm, and matches the CD player nicely with the same fascia, central display panel (which has its own power supply to avoid any fouling of synergy with the main board) and sparse button array. In fact there are only three buttons (Source select up and down and a separate Tape select button – no tone or balance controls) and the volume control. I quite like the volume control – it’s a dial-like design, set flush into the front panel with an indent for the user’s finger (it’s a digital control; there is no potentiometer in the signal path), though it can seem to take forever to turn the volume up or down to the desired level and even then gain seems low. The volume, which is displayed, along with the selected source in the blue LED display panel, goes up or down in very fine 0.5dB increments and can be muted, either by selecting Mute on the remote or by reducing the volume below -80dB (naturally). Going back to the display panel, there are six options available for customising the MXP2000 to your own preferences – these are implemented by using the remote controls Menu button and the preamps display. The options are: balance adjustment – ideal for correcting imbalances in signal sources or speaker sensitivities, Display on/off, Level trimming for each input – to balance the loudness of sources which may have different output levels, Input renaming, Power save mode (on/off) and Reset to default settings. Around the back you’ll find the IEC socket and that My-Link in/output, along with six source inputs – Line Direct (said to provide the shortest, cleanest signal path of all the inputs), CD, Tuner, TV, DVD and AUX plus Tape in/out and CD-R in/out. There’s no phonostage but you have plenty of input options if you wish to add your own. There are also two sets of Line outputs provided for connecting to a power amp (or two power amps if you want to bi-amp your speakers). The signal path is kept as nice and short as possible, using FET amps instead of many capacitors – you will notice the rather sparse interior if you care to open her up. The maximum signal output is a good >8 volts. The MXP2000 and MXC7000 both come with identical remote controls which operate both units, so if you do buy both you’ll end up with a spare remote. Bonus. The remote is lightweight and plastic but it is nicely laid out and easy to use. 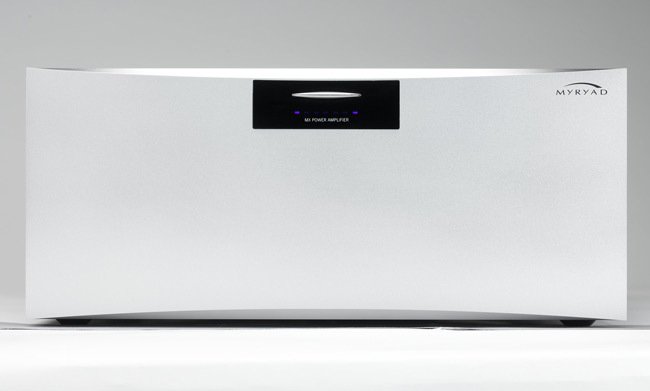 Compared to its partnering components, the MXA2150 power amplifier is a veritable beast. Weighing a hefty 25kg and measuring 436W x 190H x 479D mm, it’s pretty much a two person lift and will require a decent- sized rack or a good area of floor. It has the same elegant front panel as the preamp and CD player, except without any buttons or switches save for the “Standby Ellipse” and a small display window with seven LEDs which are allocated to each power module installed (more on that soon) but also act as fault reporters (for overheating, AC power failure, short circuit, etc), for which there is a table in the owner’s manual for referring to. [Short catch of breath – Ed] Around the back is the power on/off switch, IEC socket and one pair of speaker binding posts and line in/outputs per power module installed. Now, let’s look at those power modules. The MXA2150 comes ready fitted with two 150 watt (into 8ohm; 230 watts into 4 ohms) power amp modules for a standard two channel set up. However, the exciting bit is that there is room for up to a further five modules (seven in total). You can, for example, add another two 150w modules (available in balanced and unbalanced input versions) and bi-amp your speakers (you can have up to seven 150w modules if you want) or you can add up to seven 2x80w modules giving a total of fourteen channels; you can do as you like in fact – running a two channel system for music or an impressive multi-channel home theatre setup – but the modules should be installed by your dealer if possible. Each module has a line out for bi/tri-amping or multi-room purposes and has its own processor for monitoring temperature and output current and uses a massive toroidal transformer for clean and effortless power delivery; the 150w module uses the aforementioned Vishay bulk-foil resisters for a natural and transparent sound. Even with seven modules installed, the power amp uses less than one watt of power in standby mode and switch-on is sequential which gives a soft power up. The power amp gives off very little heat, which I must admit did surprise me a little. With the use of any interconnect cable the MX components can be integrated with each other for even easier use and control. So if, for example you press play on the CD player, the pre and power amps will switch out of standby; effectively it allows you to control all three components (plus the matching tuner if you have it) as one. Some will really like this, though I wasn’t fussed either way – I prefer to have as few cables back there as possible – but it’s still a nifty little feature. I set up the MX components on a Sound Creations audio rack but found the MXA2150 power amp was too big to fit, even on the top shelf where the amp was too deep. Fortunately, I had a good solid cabinet nearby and the amp fit snugly on top of that. Capisco, who distribute Myryad as well as Mission and Castle loudspeakers, supplied me with two sets of QED’s superb Signature interconnect cables and a pair of mighty QED Genesis Silver Spiral bi-wire speaker cables for the review. I used Mission’s EX800B and EX800S loudspeakers (see review) and my own Spendor SP2/3s. I also listened to the MXC7000 CD player with my Unico SE valve hybrid, using both the Mission and Spendor speakers, and used a Rotel integrated amplifier as a preamp to test the MXA2150s sound quality. The MX components looked very nice together in an understated sort of way – simple but elegant, with quality clearly in evidence. Straight out of the box the Myryads sounded a little too laid back and not terribly rousing, but I gave them a good few days to burn in and things improved markedly. It’s also worth leaving everything on, particularly the power amp, for at least 30 minutes to an hour before settling into the bum imprints on your listening chair [Naked bum imprints? – Lurid Ed] for a good old session – music sounds better coming from a warmed up system. First into the CD tray was Pitch Black’s Rhythm, Sound and Movement – Rude Mechanicals Remix CD which, try as I might, I just can’t get sick of at the moment. The Myryads gave a solid and fairly convincing portrayal of this album – the sound was very smooth, grain-free with a very low noise floor. Bass was deep and powerful (this was through the Mission speakers), there was plenty of detail within the reasonably wide soundstage and music sprang out into the room to give a convincingly three dimensional soundscape. As a whole it was enjoyable and inoffensive, yet there was a certain laid-back feel to the overall sound which seemed to take away some of the attack and pace which I’m accustomed to hearing with the album. Even my standout track, ‘Harmonia (Neon Stereo remix)’ which normally excites the entire room, not to mention myself, with its thumping bass and swirling electronic sounds seemed a little reserved. I found a lot of rock music I played (Doors, CCR and Wilco) showed the same traits – loads of detail though slightly polite in terms of pace and attack. Sticking to New Zealand music, I put Karen Hunter’s album Rubble in for a spin. Described as “Dirty blues and jazzy ‘story time for adults’” and reminding me a little of ‘Chuck E.’ era Ricky Lee Jones with its ‘shuffling snares’ and jazzy, funky and poppy coffee house cool (but without sounding remotely derivative), this album is beautifully performed and recorded, complete with Tom Waits-like clangs, bangs and rattles. Hunter’s backing band are fantastic and the Myryad combo gave the unmistakeable impression of a band performing live with their instruments gelling together to create one organic, smooth and buttery soundscape. There was a clear and concise placement of instruments and acoustic guitars were wonderfully full-bodied with good ringing-out of individual strings while every subtle skin sound from the cool jazzy drumming was exposed. Karen Hunter’s vocals were strong and seductive and convincingly rendered. I felt like I could have been hearing the performance in a dark cafe, late on a rainy Friday night. I could barely fault the Myryads performance with Rubble; I was sucked in and charmed and found myself listening to the album again and again, before carrying on the cool-cat theme and putting on Tom Waits’ Swordfishtrombones. With Swordfishtrombones I found there was plenty of pin-sharp detail and accurate, airy-sounding instruments dispersed over a wide soundstage with a real holographic feel. Yet while the music was smooth and flowed naturally, it was lacking a little grit – the bluesy guitars didn’t quite sound sleazy enough, seeming polished-over, as were Waits’ barking vocals which were missing some of his trademark throaty “gravel”. But I do not consider this a fault of the Myryads; rather one of their characteristics, which people are going to like or not, depending on their tastes. Personally, the more I listened to the combination, over the days and weeks, the more the presentation of the sound grew on me. My own system can be fairly revealing and brutal to certain recordings and albums like those by Tom Waits have all the grit and sleaze I think I need, but I couldn’t help liking the relaxed manner with which the Myryads handled whatever I threw at them. But in describing the sound as “relaxed”, I would not want to lead people to think that the Myryads lack excitement; funnily enough, they don’t. Having another listen to the Pitch Black and Tom Waits albums, I decided I could actually live with the more laid-back and polished presentation of the Myryads; it wasn’t bad in any way, just different. There was loads of detail, loads of charm and loads of cool – it just might depend on the type of music you listen to as to whether you find the level of excitement you may need. I decided to take the MXP2000 preamp out of the chain and added a Rotel RA1062 integrated, which I had at hand, connecting it via its pre-outs to the Myryad power amp. Sure, it’s a completely different amp and in a different price bracket, but it’s a top- performing little beast which works well as a preamp in other applications. Going through my test albums with the Rotel doing pre duties, I immediately noticed way more gain in volume with more headroom and a slightly wider soundstage, along with a little more weight to instruments – not to mention more “dirt” to blues material. The Rotel seemed to allow the MXA2150 to show itself a little more, yet there was an assured brashness, a definite Japanese solid state-ness (no bad thing by any means) to the sound and while I would hesitate to call the Myryads “valve-like” there is a certain degree of warmth to their character which is very pleasant. Putting the MXC7000 into my own system showed that in spite of its smoothness, the CD player was capable of delivering a dynamic and exciting performance, mostly free of grain and glare. It also made a darn fine transport, incorporating the dCS Debussy and Rotel RDD-06 DACs. Some may find the Myryads a little too polite and polished while others will relish their relaxed, detailed and incredibly clean delivery. Nicely built and constructed with obvious care and attention to detail, they will, individually or as a complete system, make a fine addition to your hi-fi “family”. The CD player is a bit pricey in my opinion and yet, if access to its excellent DAC via USB input was available, it could be a 5-star winner. The power amp is the star of the show, not only for its upgrade-ability but because I think it gives a champion performance with plenty of power in reserve. Perhaps the weakest link, if only by a small margin, is the MXP2000 preamplifier, because it just seems to hold the power amp back ever so slightly; nevertheless I just cannot bring myself to dislike it. Great review,I recently brought the myrard mxa7150 and it’s hooked up to a lexicon mc-8 preamp and the speakers are linn av5140.sounds wonderfully.